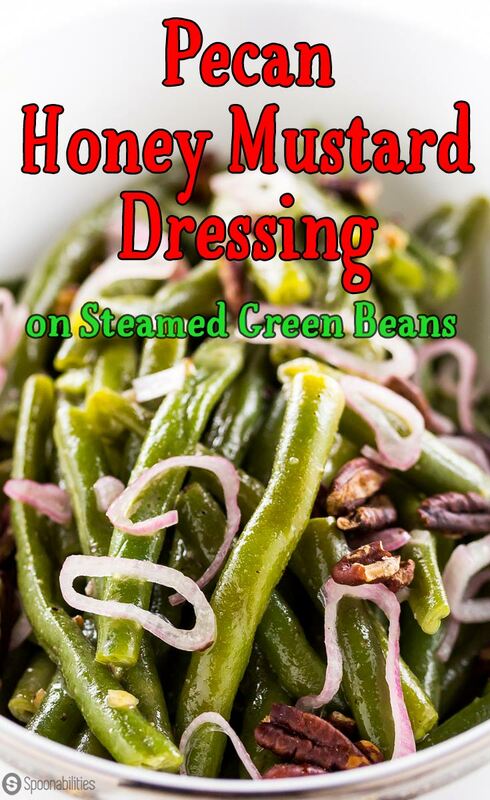 Today we are giving flavor to steamed green beans with the delicious Pecan Honey Mustard Dressing. 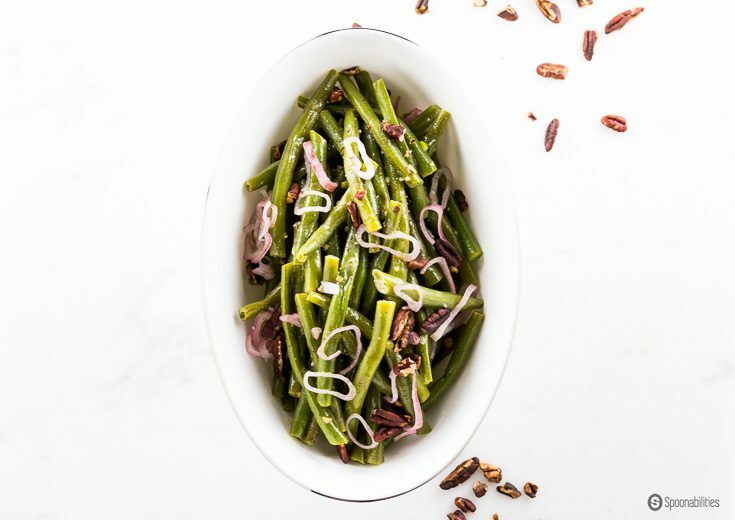 The green beans are steamed to perfection being tender inside and crisp and crunchy on the outside. For a nuttier flavor, I also added chopped roasted pecans on top and a bit of acidity with quick pickled shallots. This traditional Thanksgiving side dish is upgraded with this flavorful Pecan Honey Mustard Dressing. 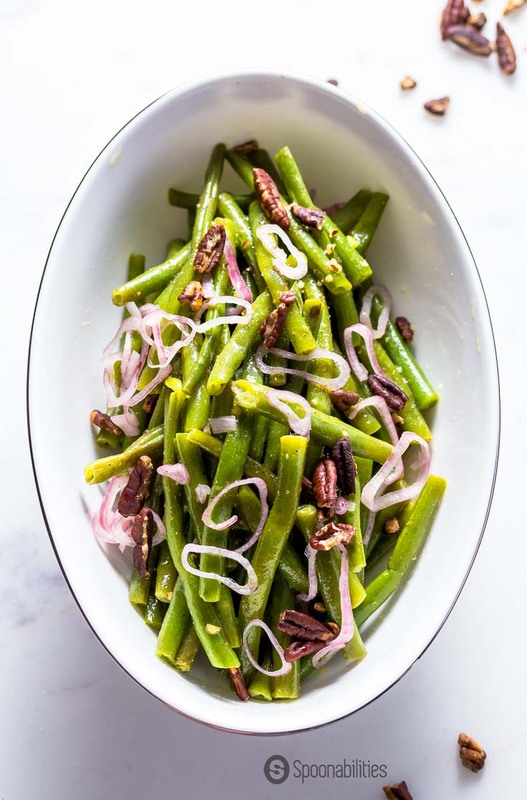 As you plan your holiday gatherings during this Autumn season, Green Beans with Pecan Honey Mustard Dressing is a fantastic side dish with simple preparation and big flavor. This Pecan Honey Mustard Dressing is very versatile and can be used as a dressing for steamed or grilled vegetables, and a a salad dressing, a marinate, or a glaze. The perfect dressing for salmon, chicken, turkey or pork. 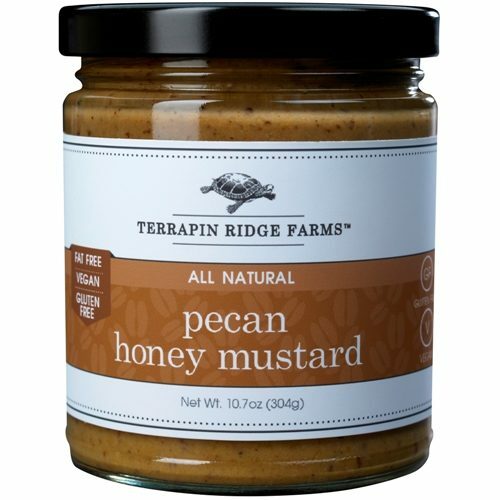 For this recipe, I used Pecan Honey Mustard which has a wonderful rich pecan flavor combined with a sweet and tangy honey mustard. I know, anything with honey mustard will be absolutely delicious, even by itself. But this one is over the top special. The original green beans recipe I was going to use asked for plain honey mustard. But we already had a jar of Pecan Honey Mustard in the fridge because we love dipping pretzels in this mustard for a tasty snack. 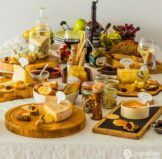 Both gluten-free and fat-free, this mustard is the perfect complement for cheeses, like an incredible baked brie. 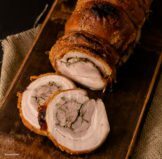 You can also use it to glaze meats and vegetables, as a sauce for pork tenderloin or roast turkey, and drizzle it on squash, carrots, sweet potatoes, and other vegetables. 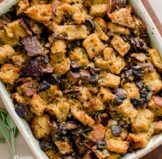 Last week, I released another Thanksgiving side dish and everyone is loving all the delicious flavors in the Shiitake Cremini White Mushroom Stuffing Recipe. So, check it out!! For this post, I forgot to photograph the Pecan Honey Mustard Dressing by itself. But that’s okay. You wouldn’t eat it by itself anyway. It always looks good on green beans right? I will be updating this post in the next week or so. Have a lovely Thanksgiving week! Follow us on Instagram and share with us if you get to make this recipe. Pecan Honey Mustard Dressing is very versatile and can be used as a marinade, salad dressing, or glaze for grilled veggies. This recipe is straightforward, quick to prepare, and you only need three ingredients. 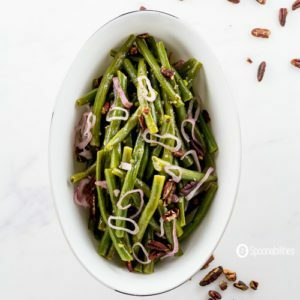 This time we will be using this dressing in a traditional Thanksgiving dinner side dish of steamed green beans, and topping with chopped pecans and quick pickled shallots. 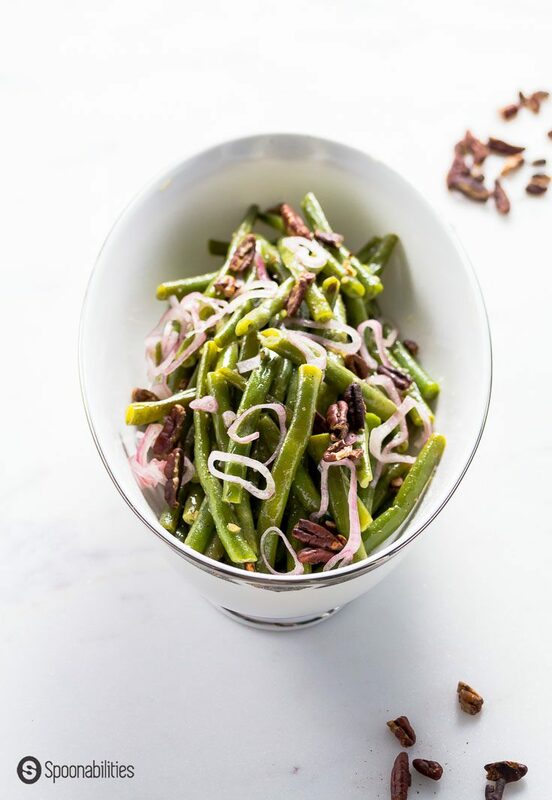 These green beans have been steamed for 6 or 8 minutes for a perfect tender texture with still a bit of crispy and crunchy. Spread the pecans on a rimmed baking sheet and toast in oven, tossing once, until fragrant - about 6 to 8 minutes. Let cool, then roughly chop. Fill a large saucepan with 1 inch of water and fit with a steamer basket. Steam the green beans until tender - about 6 to 8 minutes. Let cool. Whisk together the oil, Pecan Honey Mustard and season with ½ teaSpoon each of salt and pepper. Toss the beans with the dressing and sprinkle on the toasted pecans. Just before serving, toss with the vinegar. My mom will love this; she’s a huge fan of honey mustard dressing. This will be great on the holiday table. Hi Debi, Honey Mustard dressing is one of our top favorite dressing too. This dressing is excellent during the holidays but also anytime during the year. I would never have thought to put that dressing on green beans but my mouth is watering at the prospect. Will definitely have to give it a try very soon! Hi Bintu- the dressing is fantastic on green beans but this dressing is so versatile can be used in so many different dishes. I think nuts work so well with green beans and this dressing on the beans sounds so tasty! I’d love to try it. Hi Corina, I also think nuts works pretty well with green beans. Please try and let us know. I think it will be your favorite dressing. I haven’t tried green beans with this sort of dressing before but it certainly sounds delicious! What a delicious way to jazz up a side dish. I bet this will be popular over thanksgiving. Hello Dannii, We hope a lot of people get to try this recipe over the holidays because they will love the flavors of this dressing. Thank you so much, Agness! This recipe is a winner, and you will love all the flavors.